At an affordable price interior designing, planning & decoration on turn-key basis of offices, homes, flat, bungalow, showrooms, restaurants etc. Interior Designing, Interior Decoration Civil, renovation, repair, remodeling of both residential & Commercial project on Turn-key basis. We have our own staff from project designing to installation for interior decoration of commercial buildings and private households. Our Interior Decoration comply with International Quality Standards and their quality and durability are fully guaranteed. Where do you spend most of your time when you're home? If your family is like ours, it's probably in the kitchen. But no matter how large a kitchen is, it never feels big enough. Create more storage with Stainless Steel Modular Fittings for better storage and to save space, Add glass fronts on wall cabinets, under-the-counter lighting and granite counter Top. Everything you need to create your custom bathroom from start to finish. Our professional designers can help you build the ultimate bathroom from the ground up, with a sink, tub, toilet, shower, tiles and accessories to match. Accessories to complement the style and finish of your bathroom. Gorgeous looking UPVC window & Door designs that will transform your home and protect you from noise, dust, rain, pollution and rising energy costs. 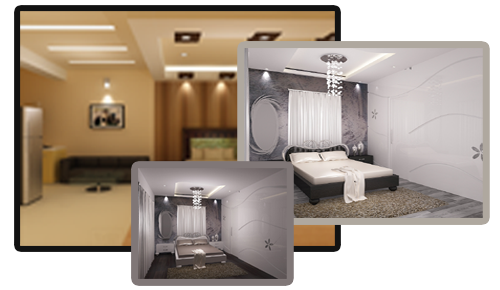 False Ceiling and P.O.P Cornices.